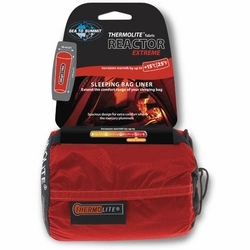 Sea to Summit Reactor Extreme Thermolite Liner increases sleeping bag performance by up to 25°F (14°C) with super-insulating 110g/m² Thermolite® fabric. Thermolite® is a hollow core fiber that provides extraordinary warmth for its weight and remains extremely breathable. Spacious design allows for a comfortable night’s sleep, even when the mercury plummets. Perfect for extending the season of your sleeping bag.